This entry was posted on Wednesday, August 25th, 2010 at 9:13 am and is filed under Middle RCA Years: 1973-1976. You can follow any responses to this entry through the RSS 2.0 feed. Both comments and pings are currently closed. As a novelty and as a demonstration of Cherry’s underrated abilities, I Am a Laser is worth listening to once, since it not only gives a taste of Bowie’s future direction but also of how tuned into the burgeoning disco scene Bowie was. But my word, these are some of the worst lyrics of Bowie’s career, and it seems almost sadistic he would give them to someone he ostensibly cared for. The first time I listened to the astronettes tracks I was very surprised- the tone of some of the biographies suggest Cherry was a mediocre talent whom Bowie helped out of attraction, and clearly she was more than that. In addition, Bowie dedicated the ambivalent “Win” to Ava… strange song for a lover. Almost taunting. Agreed. Horrible song – I’m wondering if it was inspired by Bowie’s (thankfully short-lived) ‘Pork’ obsession? Doesn’t suit Ava’s voice either. Just listening to these now, fascinating stuff. 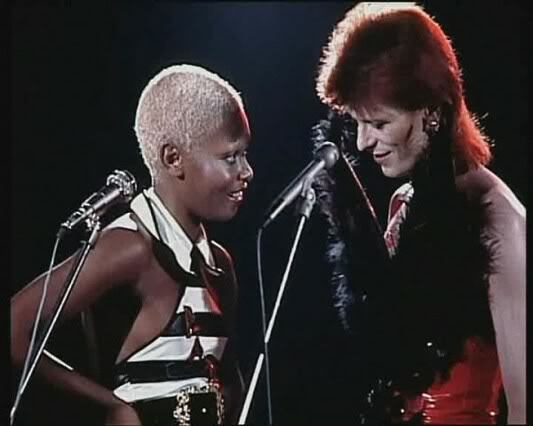 (By “horrible song” I mean ‘I Am a Laser’).’Win’ I can deal with – I obviously have no idea what went on between Bowie & Cherry but from things she’s said it seemed quite intense and complex relationship.